CicLAvia just celebrated its fifth anniversary with a car-free event from MacArthur Park to downtown L.A. over the weekend. And it looks like these one-day events might be doing some good for the environment, especially by significantly reducing air pollution, according to a new study. The UCLA Fielding School of Public Health took a look at last October&apos;s "Heart of Downtown" event, a route that went through the neighborhoods of Echo Park, Chinatown, Boyle Heights and East L.A. They measured the air quality on the day of the CicLAvia event, as well as the Sundays the week before and after it for comparison. It turns out that CicLAvia&apos;s events, which close off streets and encourage people to use non-motorized modes of transportation like walking, bicycling, and rollerskating, could be making a major impact on air quality not only in the closed-off streets, but in nearby communities as well. Particulate matter and ultrafine particles aren&apos;t great for your health. According to UCLA, particulate matter that&apos;s 2.5 micrometers or smaller is linked to respiratory and cardiovascular disease, lung cancer and premature death. As for ultrafine particles, those pose an even greater risk for those illnesses. The authors of the UCLA study that was published in the Environmental Pollution journal said that they would still need to measure other future CicLAvia events to get a full understanding of how these events truly affect local air quality. 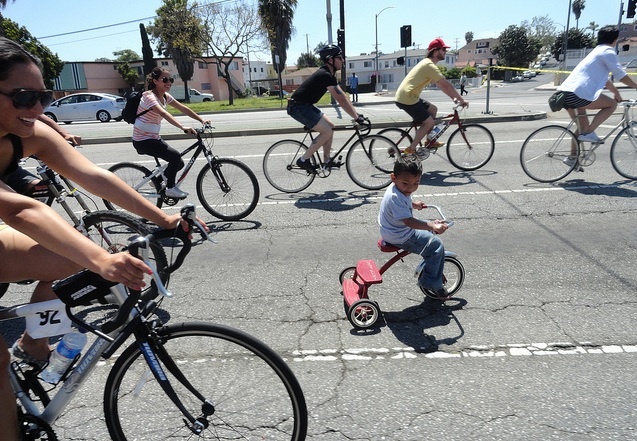 They acknowledged that October&apos;s event was just a small sampling, but found that these type of car-less, open-street events would be beneficial to the local community and CicLAvia participants.